In the last post I introduced you to the basics of meta-analysis using metafor together with ggplot2. If you haven’t seen that post, I suggest you go back and read it since this post will be hard to follow otherwise. In this post I will concentrate on trying to explain differences between different sites/studies. 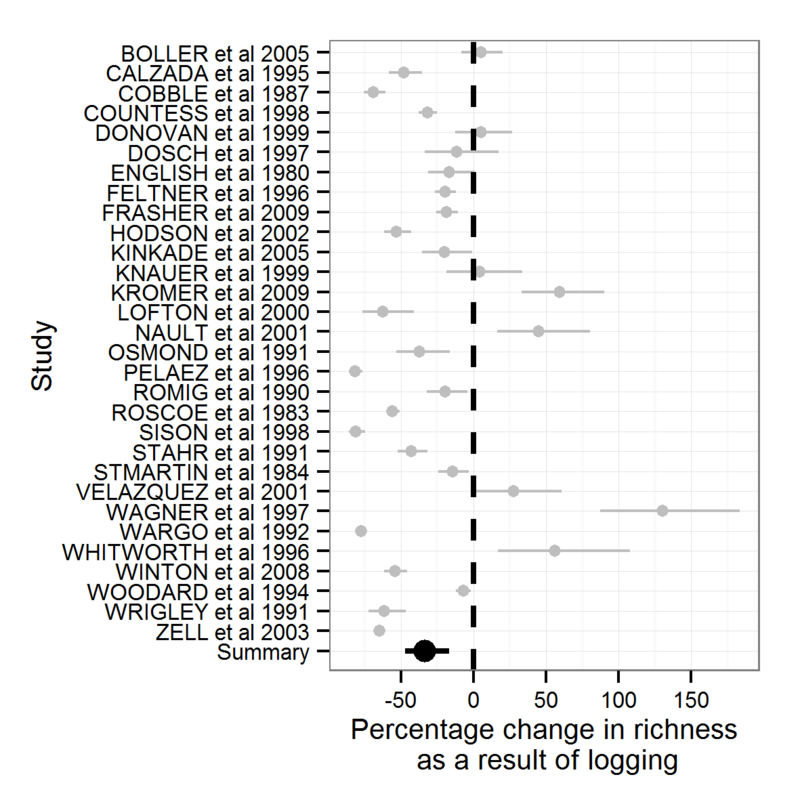 Going back to our previous example, we saw that logging tended to have a negative effect on species richness. 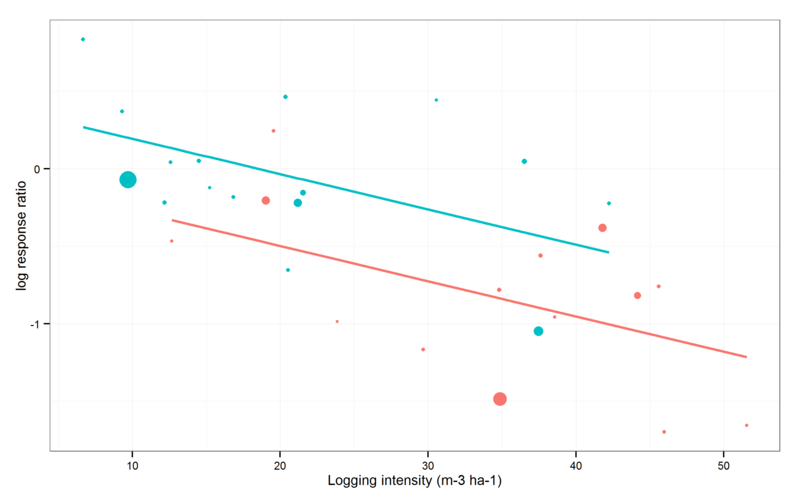 Luckily my completely made up data had information on the intensity of logging (volume of wood removed per hectare) and the method used (conventional or reduced impact). 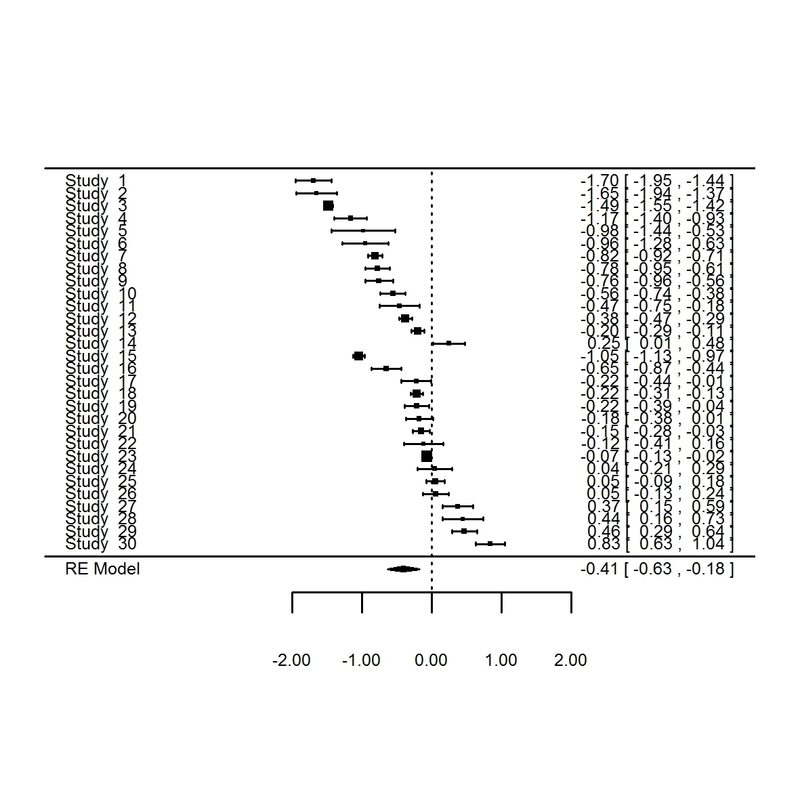 Looking at our residual plots, they seem to conform to our assumptions of constant variance. Our models suggests that the more wood is extracted from a forest the greater the negative effect on species richness, but that seems to be little evidence about the effect of method or the the interaction between intensity and method. Unsurprisingly, intensity is now more significant. However, we have taken out method which may have some value in explaining differences. The tool I use most for model selection is AIC. This basically aims to get the best fitting model with the least explanatory variables. This is why I did the last step of removing method. It could be that the effect of method is significant but adds relatively little explanatory power to our model. Let’s test this by calculating their AICs. We choose the model with the lowest AIC, in this case Model2. To calculate the fit of our model, we can compare it to our intercept only model (the original meta-analysis from part 1), but we have to set method=”ML” since REML is a poor estimator of deviance. Circle size is relative to weight for each study, since we weight the most precise studies most heavily. Blue points and line refer to reduced impact logging sites, while red refers to conventionally logged sites. 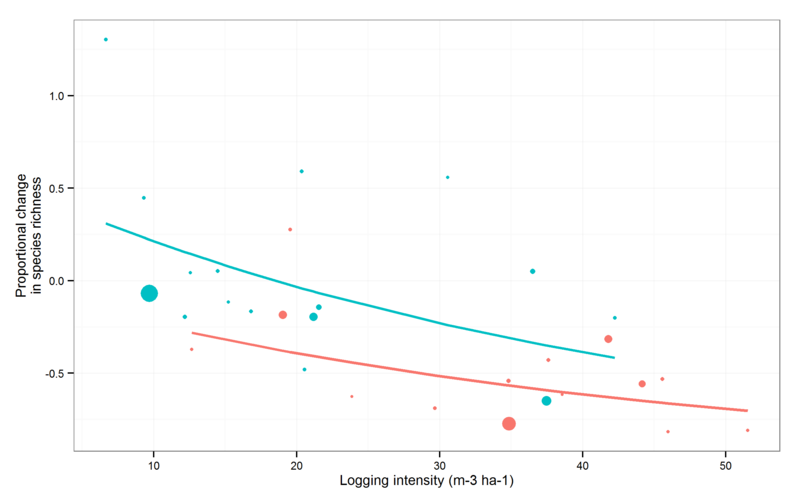 The graphs show that, for my made up data, reduced impact logging has a less negative effect than conventional logging on species richness when carried out at similar intensities but that increasing intensity leads to reductions in species richness for both conventional and reduced impact methods. I think that wraps it up for now. I hope you’ve found this useful. As ever any comments or questions are welcome. I will be back to writing non-stats posts again soon! I really like meta-analysis, as some of you might already know. It has it’s critics but used well it can help us achieve one of the major goals of applied ecology: generalisation. This way we can say how we think things generally work and draw conclusions bigger than individual studies. However, for some reason people have got it into their head that meta-analysis is hard. It’s not. The hardest thing is the same as always, coming up with a good question/problem. However, for a first timer it can seem daunting. Luckily there are a few good R packages for doing meta-analysis, my favourite of which is metafor. The aim of these posts is to take some of the mystery out of how to do this and was prompted by a comment from Jarret Byrnes on a previous blog post. In the first post I will deal with effect sizes, basic meta-analysis, how to draw a few plots and some analyses to explore bias. In the second I will go through meta-regression/sub-group analysis and a few more plots. It shouldn’t be too hard to understand. For this I will use a dataset based on some work I am doing at the moment looking at the effects of logging on forest species richness. However, I don’t really feel like sharing unpublished data on the web so I’ve made some up based on my hypotheses prior to doing the work. This file contains data on species richness of unlogged (G1) and logged (G2) forests, it’s not perfect as all of the data is made up – it should be useful for an exercise though. First we need to calculate the effect size. This is essentially a measure of the difference between a treatment and control group, in our case logged (treatment) and unlogged (control) forests. We can do this in different ways, the most commonly used in ecology are the standardised mean difference (SMD) and log mean ratios (lnRR). where and are the different group means, is the pooled standard deviation ( I won’t explain this here but there are good explanations elsewhere). Essentially what this does is to give an effect size based on the difference between groups with more imprecise studies having a smaller effect size. which gives the log of the proportional difference between the groups. I quite like this as it is easier to interpret than the SMD as the units can be back-transformed to percentages. From now on in this post I will use the lnRR effect size. Next we carry out a meta-analysis using the variability and effects sizes of each set of comparisons to calculate an overall mean effect size, using the idea that we want to give most weight to the most precise studies. This is the code for a mixed effects meta-analysis, which basically assumes there are real differences between study effect sizes and then calculates a mean effect size. This seems sensible in ecology where everything is variable, even in field sites which quite close to each other. Essentially what it’s saying is that logged forests tend to have lower species richness than unlogged forests (the model results bit), and that there is quite a lot of heterogeneity between studies (the test for heterogeneity bit). to get things in percentages. 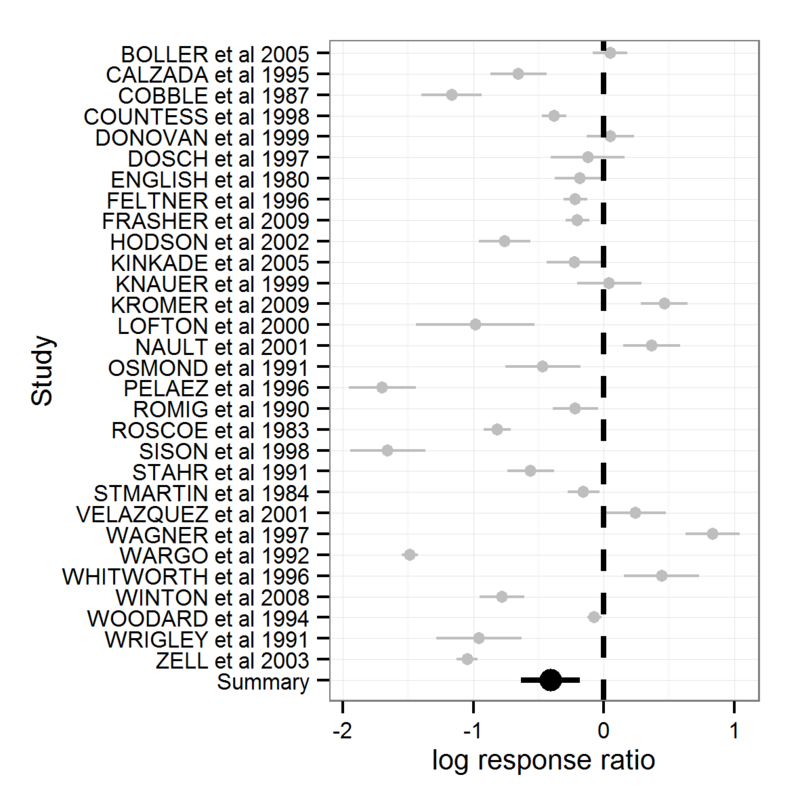 So, now we can say that logged forests have 33% less species than unlogged forests +/- a confidence interval of 25%. We can summarise this result using a forrest plot in metafor, but this is a bit ugly. What did I tell you? Pretty ugly right? With a little tweak we can even have it displayed as percentage change, though your confidence intervals will not be symmetrical any more. There that’s a bit more intuitively understandable, isn’t it? Right, I will sort out the next post on meta-regression and sub-group analysis soon. In the meantime feel free to make any comments you like.